"Long time no see", is a saying everyone is familiar with. Most people do not realize that this saying originally comes from China. The Chinese language is very rich in idioms and sayings and a lot of them are based on a story. I love Chinese sayings in general but particularly the ones that have a story to go with them. As a student learning Chinese in a classroom, it made my day of study much brighter when we read a story that was connected to a saying. It never felt like learning in the classical sense but rather like reading a fairy tale. My favorite story is probably the one about an old man, Sai Weng, whose horse runs away. The neighbors come and pity him, but he isn't too unhappy and just says, "Who knows what it [the horse] is good for". After a while, the run-away-horse comes back and brings another horse with him. The neighbors come and congratulate him, but the old man isn't too happy and just says, "Who knows what it is good for". The old man has a son who while riding the new horse, falls off, and breaks his leg. Again, the neighbors come and pity the old man, but again he isn't too unhappy about it and just says, "Who knows what it is good for". At last a war breaks out and all the fit men are called to the front, and many of them never return. The son of the old man cannot go to the front due to his broken leg and therefore survives. The story of "Sai Weng lost a horse" stands for something that happens and seems good or bad, but you don't know what it will be good for in the future. I read this story once and never forgot the saying. It's not just that I enjoy reading the stories behind sayings, but they are also good conversation topics. My Chinese friends and colleagues are always amazed when they realize that I know where many of the sayings come from. Most of the time they like to make a game out of it to see how many I know. By the end of our conversations I learn a new story and a new saying. These stories help me improve my Chinese language and learn some worldly wisdom. Take the story behind the Chinese saying of "careless/just so so" for example. In Chinese, the word "careless/just so so" is "Horse, horse, tiger, tiger" and it goes back to a story about a painter. One day, when he had just finished a painting of a tiger's head, his friend came to ask him for a painting of a horse. So, he painted a horse's body behind the tiger's head. His friend didn't like the painting, so the painter hung it in his own living room. 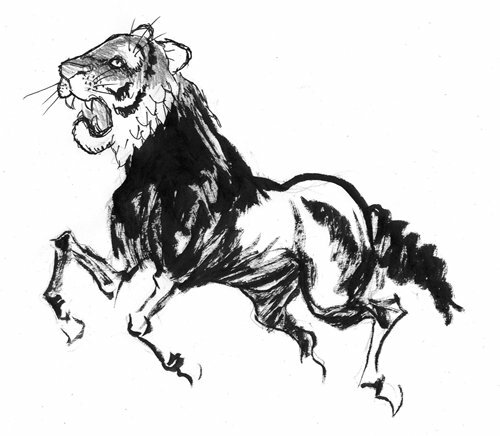 When his eldest son asked him what it was, he said a tiger, but he told his youngest son it was a horse. So, when his eldest son went hunting, he shot someone's horse, because he thought it was a tiger. And when his youngest son saw a tiger, he wanted to ride it because he thought it was a horse. This story teaches us how important it is to be precise and not careless.